It looks like British Columbia is a few steps ahead of Washington State’s push toward a carbon tax. BC’s Finance Minister, Carole Taylor, introduced an escalating carbon-tax just a few days ago. Starting on July 1st, the tax will add an extra 2.4 cents for every purchased liter of gasoline (that’s about 9 cents a gallon). The tax rate will escalate annual until 2012, when the tax will stop at 7.2 cents / liter (about 28 cents a gallon). Compared to the carbon-tax proposed in Washington State, the rates are relatively the same. So what makes this tax so much better? First off, BC’s carbon tax bill isn’t all bite, and isn’t completely insensitive toward consumers. “We want to bring in the benefits first,” said Taylor. “We made a policy decision that it was an important part of this carbon tax that individuals were protected as we start out on this journey.” The benefits will be coming by way of a one time $100 check in the mail. The cash will (hopefully) help individuals adjust to a lower carbon producing lifestyle. Secondly, the tax has managed to by step an important criticism. A gas tax is often seen as regressive, by placing an ever-growing burden on the lower and middle class. The BC carbon-tax is different. The money made from the tax will be funneled right back to consumers by means of lower income taxes. Some qualifying families will also receive $100 annual offsets throughout the program. This system makes the tax “revenue-neutral”, so even the government isn’t profiting. Despite all this, BC’s carbon-tax bill misses an important objective. It’s great to see that the government wants “to bring in the benefits first”. But a one time check isn’t the type of benefits that will advance an environmentally-friendly lifestyle. Wouldn’t it be better to send out “convert your car to bio-fuel” coupons instead of $100? Or use the money to build decent commuter bike lanes? Even more importantly, the bill doesn’t really stimulate a change in behaviors. At the end of the year, the costs for BC consumers balance out. Without added costs and without any extra incentive to change, why would anyone change their habits at all? Regardless of its downfalls, this bill is a huge political success. Historically, many politicians are hesitant to support a carbon-tax for fear it may be career damaging. BC’s new tax is proof otherwise. United States – it’s time to catch up! Political experience is a hot topic for presidential candidates Clinton and Obama. I was planning on writing an article detailing each’s experience in the Senate, but Grassroots Mom beat me to it. Her analysis shows a great in-depth look at the various bills each candidate has authored or sponsored during their Senate tenure. Read it and you will become informed. Voting records show that both candidates support similar issues. Obama is frequently a co-sponsor on Clinton’s bills, and vice versa. Although each candidate shares similarities, they’re method to create change is different. In the instance of lead paint for example, Clinton suppored legislation that would provide tax incentives to companies who removed lead paint. Obama supported classifying lead paint as “hazardous” and regulating its use. Market incentives vs Regulation. Clinton has introduced a hefty amount of healthcare legislation. Her focus is mainly on women and children. Obama’s legislation is more broad. Healthcare, energy, global warming, nuclear proliferation, foreign policy (ie Iran), and Blackwater are all subjects of bills he brought forth. An interesting point: many of Clinton’s bills have no co-sponsors. Speculation as to why this is can lead to any number of conclusions. What a day for a caucus! Over the last few days, visits from the major candidates and headline news coverage encouraged even the most apathetic of us to think about participating in the caucus. The excitement only grew Saturday morning. Flurries of phone calls, text messages, and emails from politically savvy friends all sent the same message: GO TO YOUR CAUCUS AND VOTE! The middle school where my precinct caucus took place was at capacity before 1pm. Even arriving 30 minutes early didn’t help avoid the line to get through the door. It was an eclectic group of people to say the least, but it seemed as though everyone was excited to be doing something to improve our country. At the caucus, Obama political swag decorated the windows and hallways. Many caucus goers were decked out in stickers, buttons, and “I have a crush on Obama” t-shirts. Surprisingly, Hillary signs were no where to be found. An initial precinct vote mirrored the disproportionate display of posters on the wall. 4 Barak Obama delegates, 1 Hillary Clinton, and 1 undecided. Following the vote, citizens had a chance to speak for the candidate. The first caucus goer to speak up was a Obama supporter named Phil. He first introduced himself as an avid listener of Right Wing radio, explaining that “one has to know your enemy if you’re going to defeat them”. Phil supported Obama because of his electability. In fact, most of the caucusers supported their candidate based on electability. Hillary supporters felt that Obama’s limited experience would be an easy target for Republicans. Obama supporters felt just as strongly the other way. A few political issues did come up in discussion. Global warming, Supreme court justice choices, and healthcare were all spoken about as important issues. However, our precinct’s knowledge on policy was meshed together from various CNN and Seattle Times headlines. We were an eager group, but not the most informed. The undecided voters were not really undecided, but were (surprisingly) strong fans of Dennis Kucinich. Following a few hushed whispers in their direction that Kucinich had dropped his candidacy, the undecided were persuaded to join with Obama; leaving the delegates at 5 to 1. For a politico and activist, attending a caucus can be emotionally conflicting. On one hand, democracy can be a frightening process. Our delegates were selected based on a few news headlines. It makes one realize slogan writers and marketers have quite a bit of influence. On the other hand, the entire experience can be inspiring. Witnessing voters line the block to participate in a caucus will make every rainy day spent registering voters seem worth all the effort. The most amazing part of the caucus, however; is how it reflects the value that everyone’s voice counts. Our delegates weren’t selected in a dark, smoked filled room. It was inside hallways of old middle schools and churches that Washington state helped select our next President. *The AP is reporting that Obama swept caucuses across the state. Initial numbers indicate he’s winning 65% of the delegates to Clinton’s 33%. ** Update ** The Washington State Democrat’s website is reporting Obama at 67.5% and Clinton at 31%. The delegate split is 21,629 and 9992 respectively. A quick follow-up on my last post…. Seattle’s local NPR station ran a story a few days ago on Northwest farmers. The rising prices of corn and wheat are beginning to have an effect on which crops farmers are choosing to plant this year. Seed distributers are running out of corn and wheat seeds, but seem to have plenty of other crops available. The problem? Farmers are following the money. Land that once grew beans, alfalfa, potatoes, and bluegrass for golfcourses has been moved over to provide wheat and corn. Enter: developing agricultural countires. With such a large hole forming on the supply side of these crops, agricultural industries throughout the world have an opportunity to be competitive. If ever there was a time to get a toe-hold into US markets, now is the time! Does the End of Cheap Food mean the End of Poverty? 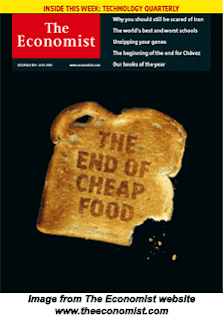 There’s an article from the Economist titled “The End of Cheap Food” which has been floating around my office for a while now. Earlier this week, the article made the front page of Digg. This news isn’t suprising – the article follows up months of gossip regarding the rising costs of food in general. I still remember last summer when Nabisco and Hershey both forecasted rising costs for chocolate. The price hikes we’re seeing (and will continue to see) boil down to a change in demands. China and India are becoming richer – and with it comes a taste for the finer things in life. Larger portions of meat and grains for a lot of people are increasing demands for food. Additionally, the US is demanding more and more ethanol-based fuel to help with its energy demands. The Economist reported that a third of the corn grown in the US last year went to bio-fuel production. With food prices rising, it sure is a great time to be a farmer – as long as you’re in the US or Europe that is. Farmers living in these regions are reaping the benefits of higher-than-ever food costs, while still profiting from large government subsidies. US and European subsidies and tariffs have crippled agricultural economies throughout the world. Subsidies distort the world price of food to the point that many of the world’s farming nations can’t afford to sell their products on the global market. In many cases, it has become cheaper for agricultural nations to import food rather than grow their own. Ultimately, this makes entire nations completely vulnerable to market changes. Even a slight change in global prices can mean the difference between food and famine. The article insists that if ever there were a time for the US and Europe to eliminate their farm subsidies that now is the time. While they may be correct, this outcome is unlikely to happen. US and European farmers are riding a wave of profits that hasn’t been seen in a long, long time. Farmers and lobbyists have fought long and hard to get these subsidies into place. In the US, a politician voicing any opposition to farm subsidies will likely be unemployed by the next election cycle. It is unrealistic to believe that these farmers/political constituents will readily give up subsidies that kept their industry afloat for so long. Fortunately, not all hope is lost for developing nations. The US’s increased biofuel demand will doubtlessly lead to a global price increase on corn and wheat while simultaneously persuading US farmers to sell their product domestically. Developing nations who grow corn and wheat may begin to see opportunities to sell their products in international markets that were formally occupied by US farmers. Countries should also look to the future to find market advantages. As more farmers begin planting corn and wheat, the supply of other crops will began to dry up. A developing country that fills in the gaps left by US farmers will find themselves at a huge advantage over the next 2 to 3 years. Besides making a lot of money, these governments could use their market power to put pressure against US and European tariffs.